My exhibition is closed Mondays and Tuesdays and I have a few hours off! I may only have been open for two days and an evening so far but this exhibition has been some weeks in the preparation, and the sudden cessation of activities has left me a little unsure what to do with myself. So I drew some cats. Meanwhile Percy is guarding the last Swimming Calendar by washing his bottom on it (it’s ok, it’s wrapped in cellophane and underneath a cloth). Freyja is observing in case Percy needs to take a break. Yes, you did read that correctly, I have a single swimming calendar left (apart from a handful out in galleries). I am feeling rather pleased, thank you, all you swimming enthusiasts 🙂 . The cats are slightly unimpressed that it was more popular than pictures of themselves. If you still want one I shall be gathering orders and putting in another order at the printers in early November but I shall only be ordering as many as people have paid for at that point, there will be no spares, so do please let me know soon. 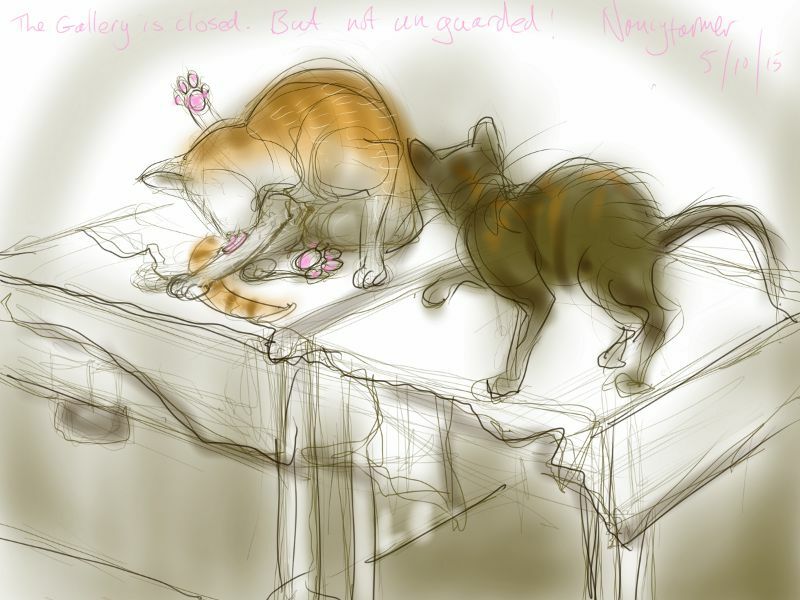 This entry was posted in Cats and tagged art, cat drawing, cat washing, drawing, Freyja Cat, Percy Cat, sketch on October 5, 2015 by Nancy Farmer.